"Fish pie is the perfect TV supper, but works equally well at a dinner party," says Mark Hix, chef director of Le Caprice, The Ivy and the famous fish restaurant J Sheekey. This versatile recipe is taken from his book Fish Etc (Quadrille; £18.99). "Try flavouring the potato topping with more cheese, herbs or even saffron," Hix suggests. Boil the potatoes in their skins for about 20 minutes or until tender. Drain and leave to cool slightly. Meanwhile, in a large pan, bring the stock and vermouth to the boil, add the onion and fennel, and cook gently for 8 minutes. Add the fish and prawns and poach gently for 2 minutes. Drain, reserving the cooking liquid, and leave to cool. To make the sauce, melt the butter in a heavy-based pan over a low heat, stir in the flour and cook gently for a minute. Gradually add the reserved fish cooking liquid, stirring till it has all been incorporated and the mixture is smooth. Bring to the boil and simmer for 20 minutes. Add the cream and simmer for 10 minutes or so until thick. Stir in the mustard and anchovy essence. Season with white pepper and leave to cool for 15 minutes. Fold the fish, prawns, fennel and onion into the sauce with the herbs. Spoon into a large pie dish or several individual ones, filling to 3cm below the top. Leave to set for 30 minutes. Peel the potatoes. Mash with the butter and just enough milk to get a soft consistency. Season. Pipe on to the fish mixture or spread with a spatula. Bake for 20 minutes (slightly less for individual pies). 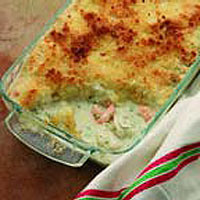 Scatter on the breadcrumbs and Parmesan, and bake for 10-15 minutes more until golden. Serve piping hot. This recipe was first published in Mon Nov 01 00:00:00 GMT 2004.